“Yoo hoo!” So said Kathryn Dreifuerst when she learned that her application was chosen for the paid summer residency program, a first, at the Fond du Lac Public Library’s Idea Studio. Dreifuerst’s application was selected for the two-month program during which she’ll work on original art in the studio and conduct several classes for the public. The Fond du Lac native and artist owns Riverwalk Art Center downtown and works in oil painting and ceramics. Her background is especially well-suited to the residency, said Idea Studio Coordinator Josh Cowles. Dreifuerst has 19 years’ experience teaching art in public schools, plus she conducts lessons for adults at her gallery. The details of Dreifuerst’s residency will be finalized before summer. Her application expressed a desire to continue working on a series of large-scale paintings of local people in public locations, using the library the setting, and offering workshops on ceramics (using portable pottery wheels), collage and bookmaking. The summer residency was established to allow the public to interact with a creative person, view her process and learn from her in the Idea Studio, the library’s makerspace. Dreifuerst is no stranger to the Fond du Lac Public Library. She volunteers her time as a tutor for Fond du Lac Literacy Services, is a frequent book borrower and enthusiastic reader. In fact, another series of her works was inspired by literature. “I’m working on paintings and mixed media pieces inspired by a single line of literature, including works by Charles M. Blow, Emily Dickinson and T.S. Elliot,” Dreifuerst wrote in her application. Her T.S. Eliot painting, “The Way the World Ends,” was displayed recently in downtown Oshkosh’s pop-up exhibit, 100 Days: The Creatives Respond. For her work in the residency program, she will earn a stipend of $750 and will receive up to $500 in reimbursed expenses for materials. The residency program is funded by the Seefeld Endowment Fund, which was started in 1992 to support special library programs and initiatives. The Idea Studio is the library’s permanent do-it-yourself zone in the lower level with equipment to use for free and DIY programming. It’s open 3 p.m. to 8 p.m. Monday through Thursday, 3 p.m. to 6 p.m. Fridays and 9 a.m. to 4 p.m. the second and fourth Saturdays of the month. More information is available at www.fdlpl.org/ideastudio and on the studio’s Facebook and Instagram pages, found at Idea Studio FDLPL. 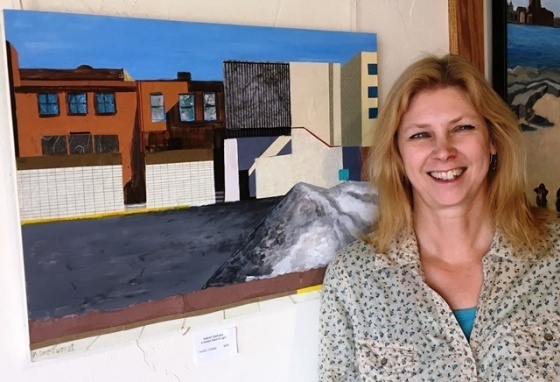 In the photo: Kathryn Dreifuerst is pictured with her mixed-media piece, A Certain Slant of Light, which was inspired by a line from a poem by Emily Dickinson.